When it comes to textiles, I pretty much love them all. 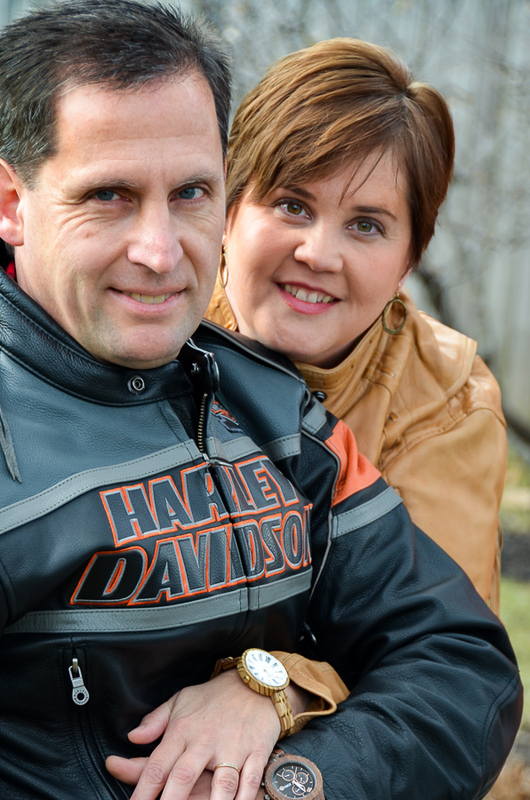 They all have a purpose and a place in this life. The textures and softness textiles bring to any decor really brings the space to life. I especially love when textiles are used in unexpected ways. Today I’m sharing with you a couple ways I’ve been using burlap in unexpected ways. Now burlap is a fabric that I have sort of a love/hate relationship with. I love the look of it and I love what other people do with it, but I don’t love to work with it myself. It’s itchy and messy and it makes my skin break out in a rash sometimes. Therefore I rarely use the stuff. I occasionally use it for a custom pillow request. Small bits of it here and there on a pillow or handbag design. But for the most part I stay away from the stuff anymore. Last fall when I did a review on Winans Chocolates and Coffees, I was given a tour of their facility where they make their chocolate and roast their coffee. At the end of the tour they offered me some burlap coffee sacks. I was to come up with a project or craft to make with the burlap and then share it with you. That was last fall. And it is now Spring. Life just kept gliding right on by as I looked at the fun burlap sacks and tried to decide what to do with them. I just love the way the coffee bags are printed. They are so fun and you can create so much cool stuff with them. 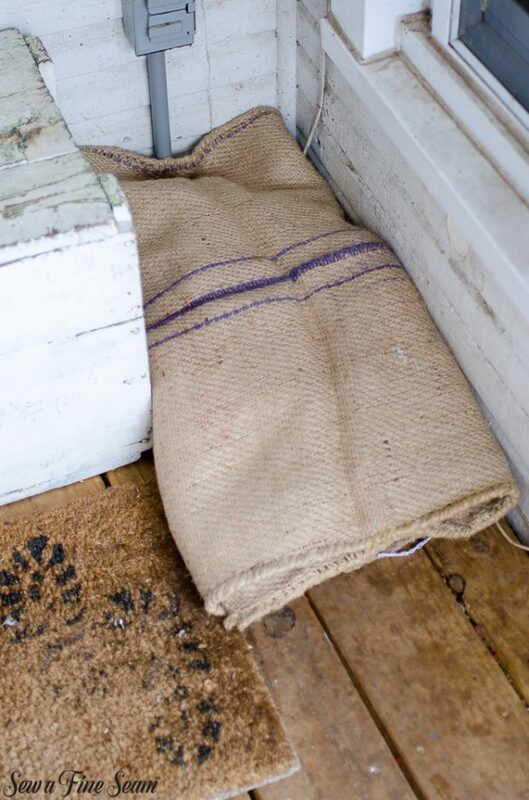 Washing the burlap is a good idea before most projects – my friend Ann, from On Sutton place has a great tutorial on how to Wash, Dry, and Cut burlap. Missy over at The Little Green Bean makes the best stuff out of burlap. If you don’t already follow her on IG you should. And make sure you check out her story on IG often – she shows off some of the most fun handbags and scrap maps that are made using burlap. 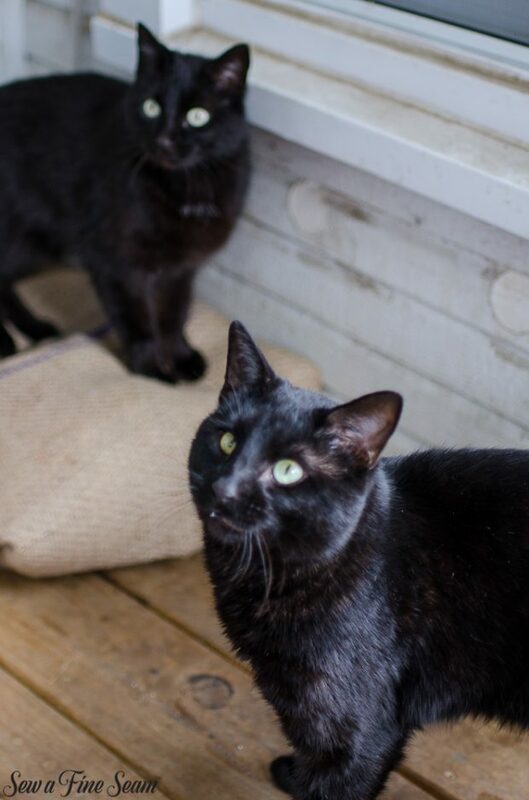 When I first brought the burlap bags home they got tossed in a pile on my porch. Where our cat, Janie, immediately found them and curled up quite comfortably on them. Watching her snuggle into the pile I concluded that the burlap didn’t bother her skin like it did mine, and I decided I would create a cat bed for her out of the burlap. My original intent was to take my pouffe pattern and redesign it and make it into a lower and bigger around size and shape and offer that pattern for sale too. I still may try to find the time to create that pattern. But the weeks and months went by and I wasn’t getting that done so this spring I moved on to Plan B. This was where the cat had been curling up. I disliked the look of the box and the mishmash of rags inside it. So I cleaned out the area, tucked new, clean rags inside one of the burlap bags and then rolled and tucked it into a shape that fit perfectly in the space we had. Of course when I wanted photos the cats didn’t want to cooperate. The cat the bed was made for was nowhere to be found at the time. 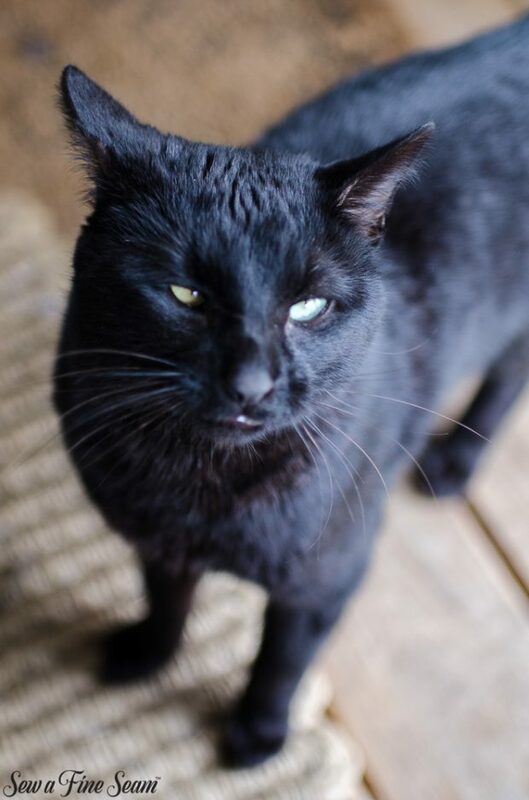 So this cat, who comes and goes as he pleases but happened to be around at the time, got to be our model. Both cats do really like the new bed. Janie curls up on it mostly, and when Midnight is around he sometimes joins her. 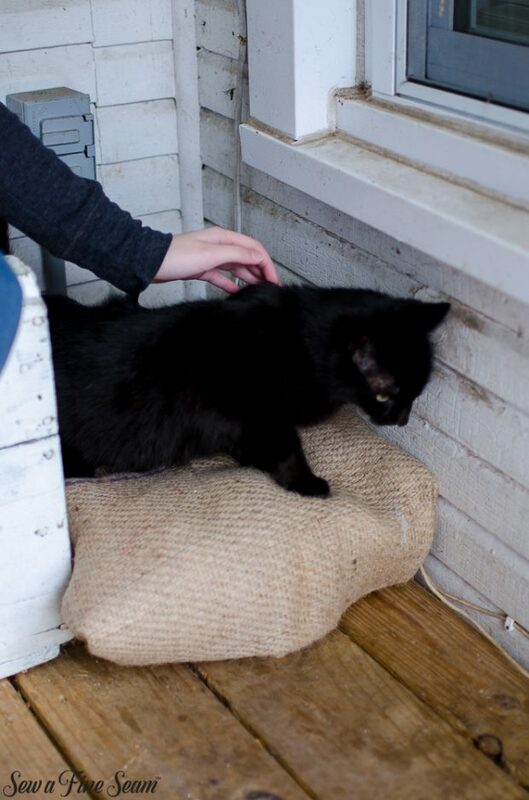 I did manage to grab this shot a day or so after the burlap cat bed had been installed. This is where Janie likes to curl up some during the day – ever since I dumped all the flowers late last fall she has been curling up in this concrete flower pot. I wonder what she will do when I plant flowers in a few days?! 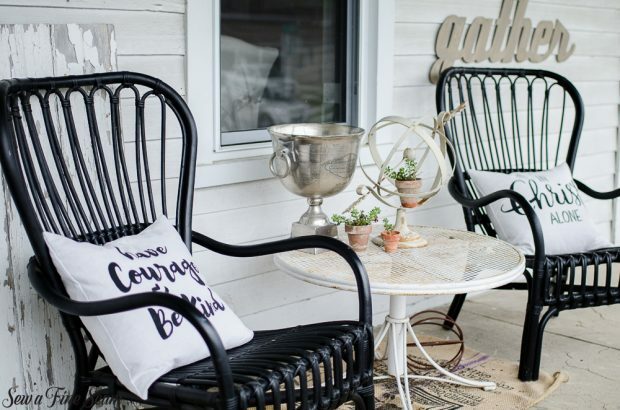 Another way I’m using burlap in an unexpected way this spring is as a rug on my front porch. 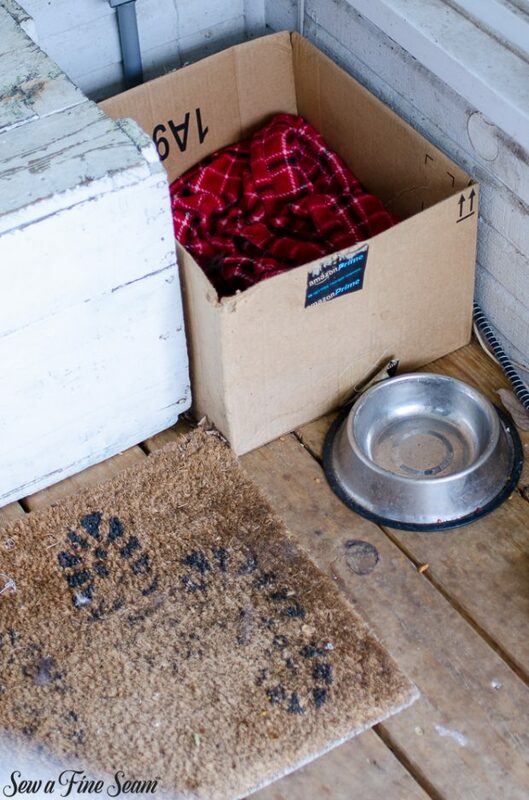 I simply unfolded a bag and placed it under the table between the chairs that grace our porch. I really like the effect. And when it gets too dirty I can shake it out and wash it if I want. Or if it gets too bad I can simply toss it and get a new one! Winans sells them in their shops for $5. 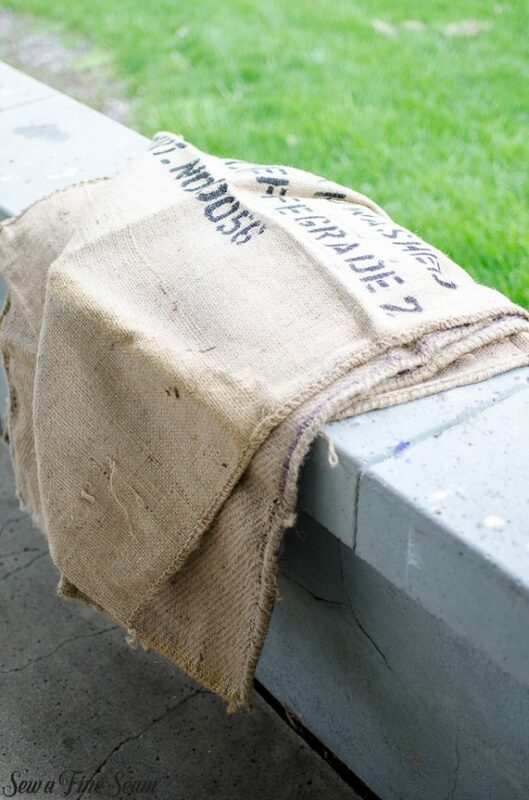 So there you have a couple fun ways to use burlap coffee bags! You can see some cute burlap banners made from coffee bags here and some fun name tags here. 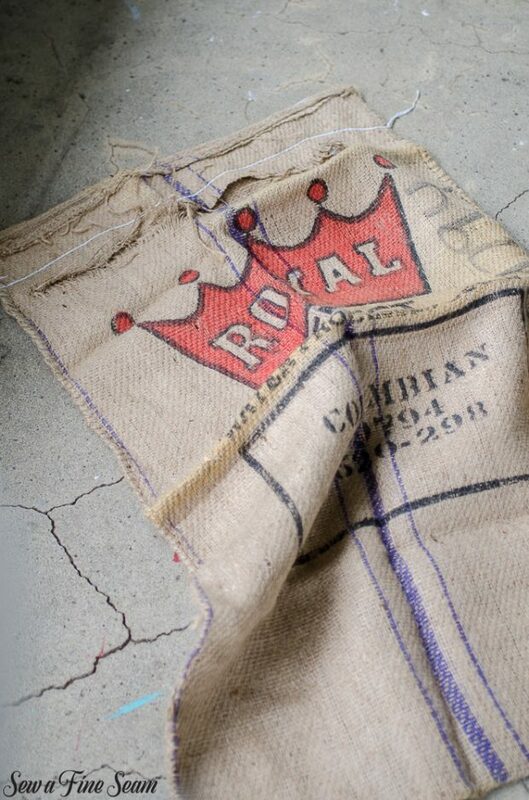 And you can find some great ideas of things to make with burlap coffee bags on pinterest! So next time you are at your local coffee shop – ask if they sell their coffee bags. And if they do make sure to get a couple! Even if you are like me and can’t work with burlap a lot there are ways to use it without handling it overly much. 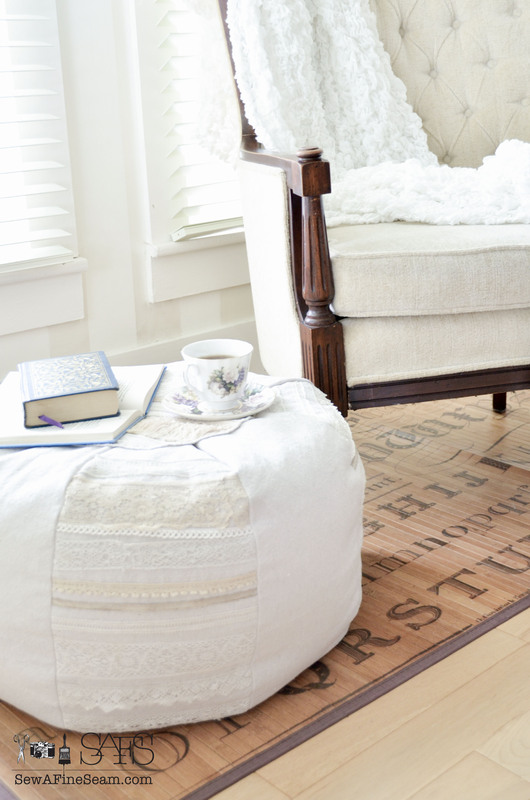 Have you used burlap for some fun stuff? Share with me in the comments, I’d love to know! 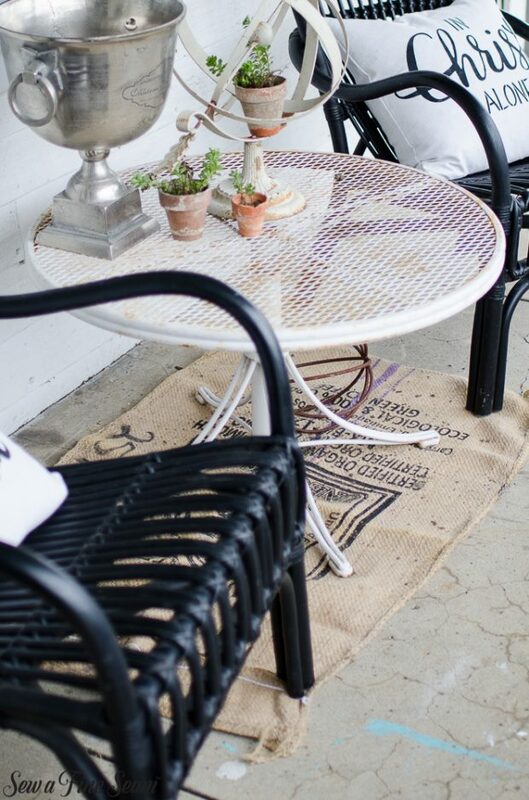 I love the idea of a rug on the porch! I’m going to try it. The cat bed is cute. 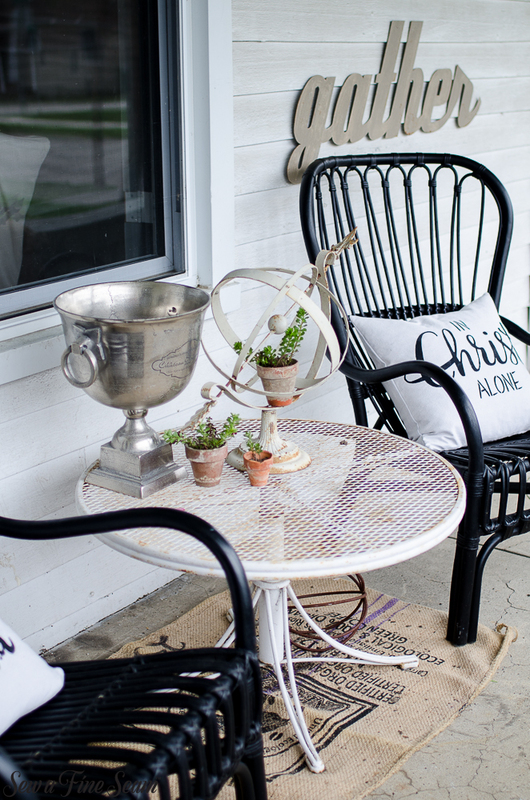 It makes a happier addition to the porch. This is a fantastic solution! 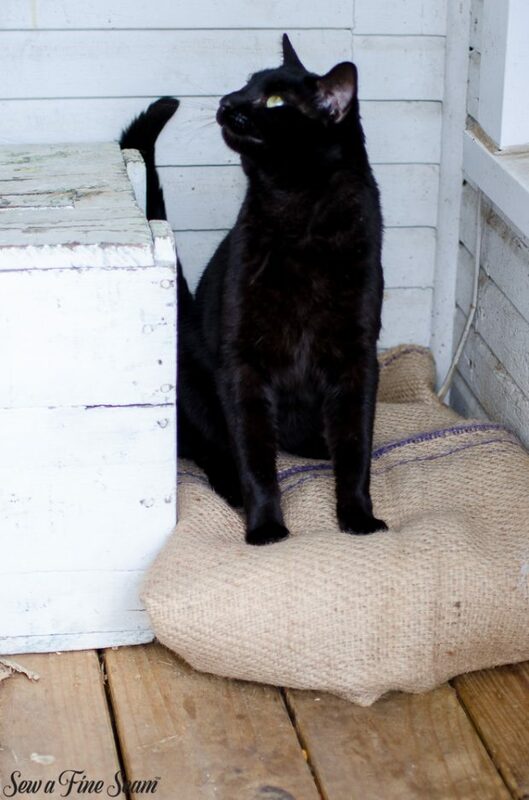 I adore the rattan chairs and your sweet kitty in the urn is just darling! Thank you Laura! 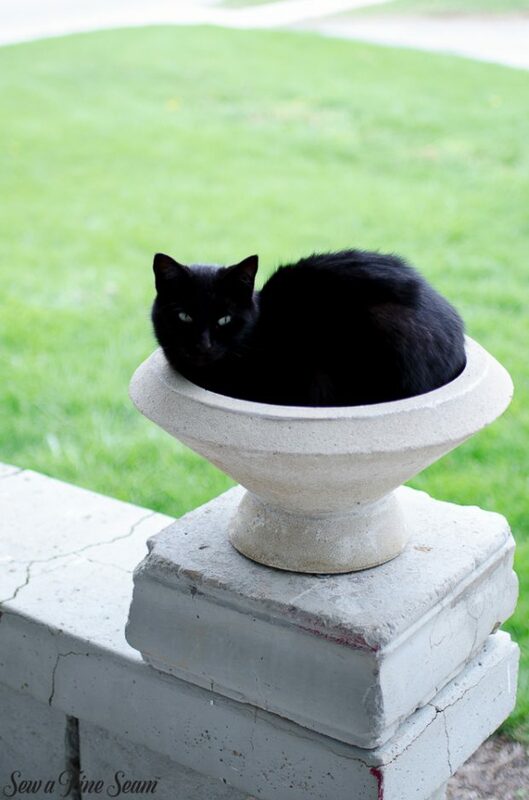 I planted flowers in the flower urn – and the kitty sniffs at them now and then just curls up on the railing beside the pot!